Back row L–R: Karen Wobig (Extension Unit Leader), Allen Blezek, Angelina Stovall-Amos, Jim Pinkerton, Dena Noe, Chris Scow, Jenny DeBuhr (Extension Administrative Services Officer); Front row L–R: Paula Peterson, Patricia Heather, Jodi Freeman. 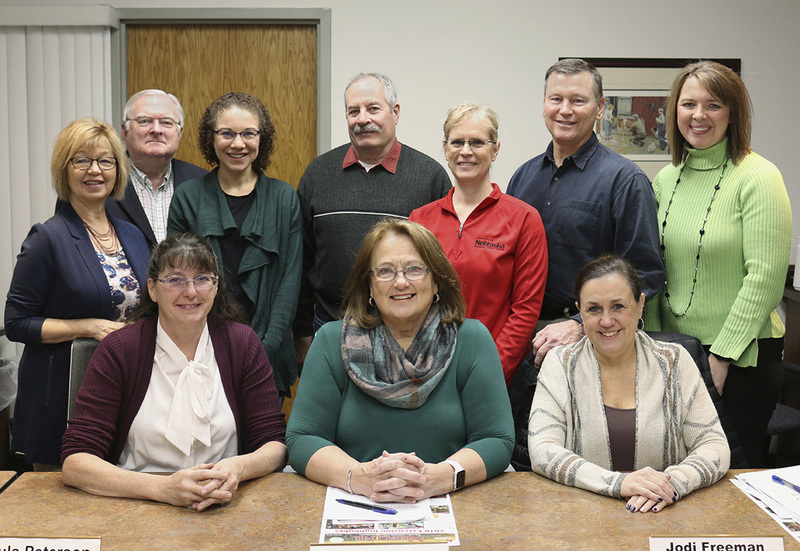 The Lancaster County Extension Board serves as an advocate for Nebraska Extension in Lancaster County. Members of the board are appointed by the Lancaster County Board of Commissioners. The Extension Board provides guidance to Extension staff in establishing and accomplishing Extension education program goals and objectives. Annually, it assists in developing an operating budget and local educational priorities. The board typically meets monthly (usually the second Friday at 8 a.m.). Bob Huttes was recently appointed for his first term. Pat Heather and Jim Pinkerton were re-appointed to serve their second terms.